It is important to be aware of the need which existed in the anthroposophical movement for Christianity to be asserted, specifically among those who were initially what might be described as ordinary listeners. For the theosophical movement under the guidance of H.P. Blavatsky had adopted an expressly anti-christian orientation. I wish to throw a little more light on this anti-christian attitude, a perspective which I also mentioned in connection with Friedrich Nietzsche. It has to be understood that the Mystery of Golgotha occurred in the first instance simply as a fact in the development of mankind on earth. If you look at the way in which I have dealt with the subject in my book, Christianity As Mystical Fact, you will see that I attempted to come to an understanding of the impulses underlying the ancient Mysteries, and then to show how the various forces which were active in the individual mystery centres were harmonized and unified. Thus what was initially encountered by human beings in a hidden way could be presented openly as a historical fact. In this sense the historical reality of the Mystery of Golgotha represents the culmination of the ancient Mysteries. Remnants of the ancient mystery wisdom were present when the Mystery of Golgotha took place. With the aid of these remnants, which were incorporated into the Gospels, it was possible to find access to this event, which gave earth development its true meaning. The impulses derived from ancient wisdom which were still directly experienced began to fade in the fourth century AD, so that the wisdom was preserved only in a more or less traditional form, allowing particular people in one place or another to revitalize these traditions. But the kind of continuous development which the Mysteries enjoyed in ancient times had disappeared, taking with it the means to understand the Mystery of Golgotha. The tradition remained. The Gospels existed, kept secret at first by the communities of the church and then published in individual nations. The cults existed. As the western world developed it was possible to keep alive a memory of the Mystery of Golgotha. But the opportunity to maintain the memory came to an end in that moment in the fifth post-Atlantean epoch when intellectualism, with what I described yesterday as modern education, made its appearance. And with it a type of science of the natural world began, which pre-empted any understanding of the spiritual world as it developed the kind of methodology seen to date. This methodology needed to be expanded in the way that anthroposophy has sought to expand it. If one does not progress beyond the scientific method introduced by Copernicus, Galileo and so on, the Mystery of Golgotha has no place within the resultant view of nature. Now consider the following. In none of the ancient religions was there any division between knowledge of the natural world and knowledge of God. It is a common feature of all pagan religions that there is a unity in the way in which they explain nature, and in how that understanding of nature then ascends to an understanding of the divine, the many-faceted divinity, which is active in nature. The kind of abstract natural forces we are now aware of, unchallenged in their absoluteness, did not exist. What did exist were nature spirits which guided the various aspects of nature, and with which links could be established through the content of the human soul. Now anthroposophy will never make the claim that it somehow wants to become a religion. However, although religion will always need to be an independent spiritual stream in mankind, it is a simple human desire for harmony to exist between cognition and the religious life. It must be possible to make the transition from cognition to religion and to return from religion to cognition without having to cross an abyss. That is impossible, given the structure of modern learning. It is impossible, above all, to discover the nature of Christ on this scientific basis. Modern science, in investigating the being of Christ ever more closely, has scattered and lost it. If you bear this in mind, you will be able to understand what follows. Let me begin by talking about Nietzsche, whose father was a practising minister. He went through a modern grammar school education. But since he was not a bread-and-butter scholar but a thinker, his interest extended to everything which could be learnt through modern methods. So he consciously and in a radical way became aware of the dichotomy which in reality affects all modern minds, although people do not realize it and are prone to illusion because they draw a veil over it. Nietzsche says: Nowhere does modern education provide a direct link to an explanation of Jesus Christ without jumping over an abyss. His uncompromising conclusion is that if one wants to establish a relationship with modern science while preserving some sort of inner feeling for the traditional explanations of Christ, it is necessary to lie. And so he chose modern learning, and thus arrived at a radical indictment of what he knew about Christianity. No one has been more cutting about Christianity than Nietzsche, the minister's son. And he experiences this with his whole being. One example is when he says — and it is not, of course, my standpoint — that what a modern theologian believes to be true is certainly false. And he finds that the whole of modern philosophy has too much theological blood flowing through its veins. As a result he formulates his tremendous indictment of Christianity, which is of course blasphemous, but which is an honest blasphemy and therefore worthy of greater attention than the hypocrisy which is so often found in this field today. It needs to be emphasized that a person like Nietzsche, who was serious about wanting to understand the Mystery of Golgotha, was not able to do so with the means at his disposal, including the Gospels in their present form. Anthroposophy provides an interpretation of all four Gospels, [ Note 1 ] and these interpretations are rejected decisively by theologians of all denominations. But they were not available to Nietzsche. It is the most difficult thing for a scientific mind — and almost all people today have scientific minds in this sense, even if at a basic level — to come to terms with the Mystery of Golgotha, and what is precisely not the old Mysteries, but the discovery of a whole new mystery knowledge. The discovery of the spiritual world in a wholly new form is necessary. Basically Blavatsky's inspiration also came from the ancient Mysteries. If one takes The Secret Doctrine as a whole, it really feels like nothing fundamentally new but the resurrection of that knowledge which was used in the ancient Mysteries to recognize the divine and the spiritual. But these Mysteries are only capable of explaining the events which happened in anticipation of Christ. Those who were familiar with the impulses of the ancient Mysteries when Christianity was still young were able to adopt a positive attitude to what happened at Golgotha. This applied into the fourth century. The real meaning of the Greek Church Fathers was still understood: how their roots stretched back to the ancient Mysteries, and how their words have quite a different tone from those of the later Latin Church Fathers. The ancient wisdom which understood nature and spirit as one was contained in Blavatsky's revelations. That is the way, she thought, to find the divine and the spiritual, to make them accessible to human perception. And from that perspective she turned her attention to what present-day traditional thinking and the modern faiths were saying about Christ Jesus. She could not, of course, understand the Gospels in the way they are understood in anthroposophy, and the knowledge which came from elsewhere was not adequate to deal with the knowledge of the spirit which Blavatsky brought. That is the origin of her contempt for the way in which the Mystery of Golgotha was understood by the world. In her view, what people were saying about the Mystery of Golgotha was on a much lower level than all the majestic wisdom provided by the ancient Mysteries. In other words, the Christian god stands on a lower level than the content of the ancient Mysteries. That was not the fault of the Christian god, but it was the result of interpretations of the Christian god. Blavatsky simply did not know the nature of the Mystery of Golgotha and was able to judge it only by what was being said about it. These things have to be seen in an objective light. As the power of the ancient Mysteries was drawing to a final close in the last remnants of Greek culture in the fourth century AD, Rome took possession of Christianity. The empirical attitude of Roman culture to learning was incapable of opening a real path to the spirit. Rome forced Christianity to adopt its outer trappings. It is this romanized Christianity alone which was known to Nietzsche and Blavatsky. Thus these souls whom I described as homeless, whose earlier earth lives were lighting up within them, took the first thing on offer because their sole aim was to find access to the spiritual world, even at the risk of losing Christianity. These were the people who began by seeking a way into the Theosophical Society. Now the position of anthroposophy in relation to these homeless souls has to be clearly understood. These were searching, questioning souls. And the first necessity was to find out what questions resided in their innermost selves. And if anthroposophy addressed these souls, it was because they had questions about things to which anthroposophy thought it had the answer. The other people among our contemporaries were not bothered by such questions. Anthroposophy therefore considered what came into the world with Blavatsky to be an important fact. But its purpose was not to observe the knowledge which she presented, but essentially to understand those questions which people found perplexing. How were the answers to be formulated? We need to look at the matter as positively and as factually as possible. Here we had these questioning souls. Their questions were clear. They believed they could find an answer to them in something like Annie Besant's book The Ancient Wisdom, [ Note 2 ] for instance. Obviously, it would have been stupid to tell people that this or that bit of The Ancient Wisdom was no longer relevant. The only possible course was to give real answers by ignoring The Ancient Wisdom at a time when this book was, as it were, dogma among these people, and by writing my book Theosophy, [ Note 3 ]which gave answers to questions which I knew were being asked. That was the positive answer. And there was no need to do more than that. People had to be left completely free to choose whether they wanted to continue to read The Ancient Wisdom or whether they wanted to use Theosophy. In times of great historical change things are not decided in as rational and direct a manner as one likes to think. Thus I did not find it at all surprising that the theosophists who attended the lecture cycle on anthroposophy when the German Section was established, remarked that it did not agree in the slightest with what Mrs Besant was saying. Of course it could not agree, because the answers had to be found in what the deepened consciousness of the present can provide. Until about 1907 each step taken by anthroposophy was a battle against the traditions of the Theosophical Society. At first the members of the Theosophical Society were the only people whom one could approach with these things. Every step had to be conquered. A polemical approach would have been useless; the only sensible course was hope, and making the right choices. These things certainly did not happen without inner reservations. Everything had to be done at the right time and place, at least in my view. I believe that in my Theosophy I did not go one step beyond what it was possible to publish and for a certain number of people to accept at that time. The wide distribution of the book since then shows that this was an accurate assumption. It was possible to go further among those who were engaged in a more intensive search, who had been caught up in the stream set in motion by Blavatsky. I will take only one instance. It was common in the Theosophical Society to describe how human beings went through what was called kamaloka after death. To begin with, the description given by its leaders could only be put in a proper context in my book Theosophy by avoiding the concept of time. But I wanted to deal with the correct concept of time within the Society. As a result I gave lectures about life between death and a new birth within the then Dutch Section of the Theosophical Society. And there I pointed out, right at the start of my activity, that it is nonsense simply to say that we pass through kamaloka as if our consciousness is merely extended a little. (see diagram above). I showed that time has to be seen as moving backwards, and I described how our existence in kamaloka is life in reverse, stage by stage, only at three times the pace of the life we spend on earth. Nowadays, of course, people leading their physical lives have no idea that this backward movement is a reality in the spiritual realm, because time is imagined simply as a straight line. Now the leaders of the Theosophical Society professed to renew the teachings of the old wisdom. All kinds of other writings appeared which were based on Blavatsky's book. But their content took a form which corresponded exactly to the way things are presented as a result of modern materialism. Why? Because new knowledge, not simply the renewal of old knowledge, had to be pursued if the right things were to be found. Buddha's wheel of birth and death and the old oriental wisdom was quoted on every occasion. That a wheel is something which has to be drawn as turning back on itself (see diagram) was ignored. There was no life in this rejuvenation of the old wisdom, because it did not spring from direct knowledge. In short, it was necessary through direct knowledge to create something which was also capable of illuminating the ancient wisdom. Nevertheless, in the first seven years of my anthroposophical work there were people who denied that there was anything new in my material in relation to theosophy. But people never forgot the trouble I caused in the Dutch Section by filling my lectures with living material. When the congress took place in Munich in 1907 [ Note 4 ] the Dutch theosophists were seething that an alien influence, as they perceived it, was muscling in. They did not feel the living present standing against something which was based merely on tradition. Something had to change. That is when the conversation between Mrs Besant and myself took place in Munich, [ Note 5 ] and it was clarified that the things which I had to represent as anthroposophy would work quite independently of other things active within the Theosophical Society. What I might describe as amodus vivendi was agreed. On the other hand, even at that time the absurdities of the Theosophical Society which eventually led to its downfall began to be visible on the horizon. For it is clear today that it has been ruined as a society which is able to support a spiritual movement, however great its membership. What the Theosophical Society used to be is no longer alive today. When anthroposophy began its work the Theosophical Society still contained a justified and full spirituality. The things which were brought into the world by Blavatsky were a reality, and people had a living relationship with them. But Blavatsky had already been dead for a decade. The mood within the Theosophical Society, the things which existed as a continuation of Blavatsky's work, had a solid historico-cultural foundation; they were quite capable of giving something to people. But even at that time they already contained the seeds of decay. The only question was whether these could be overcome, or whether they would inevitably lead to complete disharmony between anthroposophy and the old Theosophical Society. It has to be said that a destructive element existed in the Theosophical Society even in Blavatsky's time. It is necessary to separate Blavatsky's spiritual contribution from the effect of the way in which she was prompted to make her revelations. We are dealing with a personality who, however she was prompted, nevertheless was creative and through herself gave wisdom to mankind, even if this wisdom was more like a memory of earlier lives on earth and restricted to the rejuvenation of ancient wisdom. The second fact, that Blavatsky was prompted to act in a particular way, introduced elements into the theosophical movement which were no longer appropriate if it was to become a purely spiritual movement. For that it was not. The fact is that Blavatsky was prompted from a certain direction, and as a result of this she produced all the things which are written in Isis Unveiled. But by various machinations Blavatsky for a second time fell under outside influence, namely of eastern esoteric teachers propelled by cultural tendencies of an egoistic nature. From the beginning a biased policy lay at the basis of the things they wished to achieve through Blavatsky. It included the desire to create a kind of sphere of influence — first of a spiritual nature, but then in a more general sense — of the East over the West, by providing the West's spirituality, or lack of it if you like, with eastern wisdom. That is how the transformation took place from the thoroughly European nature of Isis Unveiled to the thoroughly eastern nature of Blavatsky's The Secret Doctrine. Various factors were at work, including the wish to link India with Asia in order to create an Indo-Asian sphere of influence with the help of the Russian Empire. In this way her teaching received its Indian content in order to win a spiritual victory over the West. It reflected a one-sidedly egoistic, nationally egoistic, influence. It was present right from the beginning and was striking in its symptomatic significance. 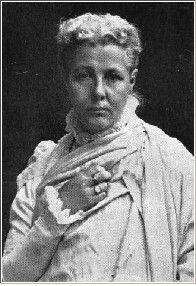 The first lecture by Annie Besant which I attended dealt with theosophy and imperialism. [ Note 6 ] And if one questioned whether the fundamental impulse of the lecture was contained in the wish to continue in Blavatsky's spiritual direction or to continue what went alongside it, the answer had to be the latter. Annie Besant frequently said things without fully understanding the implications. But if you read the lecture “Theosophy and Imperialism” attentively, with an awareness of the underlying implications, you will see that if someone wanted to separate India from England in a spiritual way, the first, apparently innocuous step could be taken in a lecture of this kind. It has always spelled the beginning of the end for spiritual movements and societies when they have started to introduce partisan political elements into their activity. A spiritual movement can only develop in the world today if it embraces all humanity. Indeed, today it is one of the most essential conditions for a spiritual movement whose intention it is to give access to the real spirit that it should embrace all mankind. And anything which aims to split mankind in any way is, from the beginning, a destructive element. Just consider the extent to which one reaches into the subconscious regions of the human psyche with such things. It is simply part of the conditions for spiritual movements, such as anthroposophy wants to be, that they honestly and seriously endeavour to distance themselves from all partisan human interests, and aspire to take account of the general interest of mankind. That was what made the theosophical movement so destructive, in so far as it contained divisive elements from its inception. And on occasion they also veered in their position; during the war there was a tendency to become very anglo-chauvinistic. But it is essential to understand very clearly that it is completely impossible to make a genuine spiritual movement flourish if it contains factional interests which people are unwilling to leave behind. That is why one of the main dangers facing the anthroposophical movement today — in an age deteriorating everywhere into nationalist posturing — lies in the lack of courage among people to discard these tendencies. But what is the root cause of this tendency? It arises when a society wants to accrue power by something other than spiritual revelation. At the beginning of the twentieth century there was still much that was positive in the way the Theosophical Society developed an awareness of its power, but that awareness had almost completely disappeared by 1906 and was replaced by a strong drive for power. It is important to understand that anthroposophy grew out of the general interests of mankind, and to recognize that it had to find access to the Theosophical Society, because that is where the questioners were to be found. It would not have found accomodation anywhere else. Indeed, as soon as the first period came to an end, the complete inappropriateness of the theosophical movement for western life became evident, particularly in its approach to the issues surrounding Christ. Where Blavatsky's contempt for Christianity was still basically theoretical, albeit with an emotional basis, the theosophical movement later turned this contempt into practice, to the extent that a boy was specially brought up with the intention of making him the vehicle for the resurrection of Christ. There is hardly anything more absurd. An Order [ Note 7 ] was established within the Theosophical Society with the aim of engineering the birth of Christ in a boy already alive here. This soon descended into total farce. A congress of the Theosophical Society was to take place in Genoa in 1911, [ Note 8 ] and I felt it necessary to announce my lecture “From Buddha to Christ” for this congress. This should have resulted in a clear and concise debate by bringing into the open everything which was already in the air. But — surprise, surprise — the Genoa Congress was cancelled. It is, of course, easy to find excuses for something like that, and every word that was uttered sounded uncommonly like an excuse. Thus we can say that the anthroposophical movement entered its second stage by pursuing its straightforward course, and it was introduced by a lecture which I delivered to a non-theosophical audience of which only one person — no more! — is still with us, although many people attended the original lecture. That first lecture, lecture cycle in fact, was entitled “From Buddha to Christ”. In 1911 I had wanted to deliver the same cycle. There was a direct connection! But the theosophical movement had become caught up in a hideous zig-zag course. If the history of the anthroposophical movement fails to be taken seriously and these things are not properly identified, it is also impossible to give a proper answer to the superficial points which are continually raised about the relationship between anthroposophy and theosophy; points made by people who refuse absolutely to acknowledge that anthroposophy was something quite independent from the beginning, and that it was quite natural for anthroposophy to provide the answers it possessed to the questions which were being asked. Thus we might say that the second period of the anthroposophical movement lasted until 1914. During that time nothing in particular happened, at least as far as I am concerned, to resolve its relationship with the theosophical movement. The Theosophical Society remedied that when it expelled the anthroposophists. [ Note 9 ] But it was not particularly relevant to be in the Theosophical Society and it was not particularly relevant to be excluded. We simply continued as before. Until 1914 everything which occurred was initiated by the Theosophical Society. I was invited to lecture there on the basis of the lectures which have been reprinted in my book Eleven European Mystics. I then proceeded to develop in various directions the material contained in it. The Society, with its unchanged views, then proceeded to expel me — and, of course, my supporters. I was invited in for the same material which later caused my exclusion. That is how it was. The history of the anthroposophical movement will not be understood until the fundamental fact is recognized that it was irrelevant whether I was included in or excluded from the theosophical movement. That is something upon which I would ask you to concentrate in your self-reflection. Today how many souls have a hint of such homelessness about them? That is revealed in incidents such as the following, which was reported very recently. A professor announced a course of university lectures on the development, as he called it, of mystic-occult perceptions from Pythagoras to Steiner. Following the announcement, so many people came to the first lecture that it could not be held in the usual lecture hall but had to be transferred to the Auditorium Maximum which is normally used only for big festive occasions. Such occurrences demonstrate the way things are today, how the tendency to such homelessness has become an integral element in many souls. All of this could be anticipated: the rapidly growing evidence of a longing in homeless souls for an attitude to life which was not organized in advance, which was not laid out in advance; a longing for the spirit among them which was increasingly asserting itself, and asserting itself more strongly week by week. Continued in the next issued of SCR.